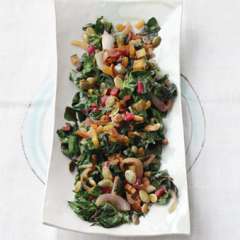 One of my favorite leafy greens is Swiss chard. I love the flavor — spinach-like, but a little sweeter. I love the way it looks in the garden. I grow ‘Five Color Silverbeet’ and the orange, magenta, yellow, and white stalks look amazing in the garden. I also love how easy it is to grow. The plants that I sowed from seed way back in early May are still going strong. If you just keep harvesting the outer stalks, and not the entire plant, new stalks will keep forming at the center of the plant. It doesn’t bolt in summer’s heat — a bonus for those who love leafy greens. It also withstands frost fairly well, which means that I’m often harvesting chard well into November. Bring a pot of water to a boil, and fill a bowl with ice water. Blanch Swiss chard stalks for two minutes, leaves for one minute. Place them in the ice water immediately after blanching to stop the cooking process. Drain well, and place the stalks and leaves in separate freezer bags or other freezer-safe containers. Freeze for up to six months. This is an easy way to make sure I am able to use all of the delicious Swiss chard growing in my garden.